Pizza – the best food on earth. Who doesn’t love it? Classic pizza by the slice, the brick oven pizza, deep dish pizza, thin crusted Roman style pizza. The list goes on and on, and believe me, I have an opinion on every type. Never the less, I am up for the challenge. Let me know what you think. Did I mention I was born in Brooklyn, NY? Nothing like a class New York pizza by the slice. Maybe with baked ziti on top. Can never lose with classic pepperoni—or any other kind—as long as there’s enough grease that you have to soak it up with a napkin and top with red pepper, garlic powder, and oregano,. And at Mulberry Pizza, they do just this. Not only is the pizza great – but they also provide you the NY Daily News to read. You’ll feel like you just landed in the Big Apple. 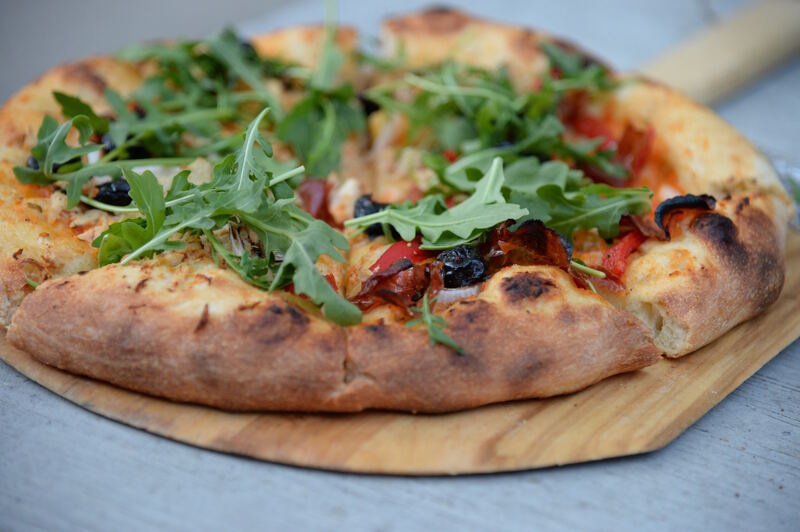 Great Neopolitan pizza cooked in a wood-fired oven at 1000 degrees for 90 seconds all under an olive tree – only at Midici. My favorite? The Prisoner’s Pizza. It’s named after a Sicilian legend of people smuggling drugs into jail through the pizza crust. Now, I don’t think that’s happening at Midici, but with the crust filled with fresh ricotta cheese and the pizzed topped with fresh crushed tomatoes, mozzarella, parmigiano-reggiano, basil and olive oil, you never know. Sit at the bar, order a glass of wine and you can have your pizza brought right to your table. On The Thirty serves twelve unique pizzas on a big wooden cutting board – big enough to share with your best friend. Nothing beats the Simple Pizza with marinara, mozzarella, oregano and basil. But if you are in the mood to tingle your taste buds and mix it up, try one of the six spicy pies. My favorite? The Thirty with spicy soppressata, wild mushrooms, kobe meatballs and more. Fantastic. Plus, with the beautiful ] patio that looks out onto Ventura Blvd and a large selection of wines, beers and cocktails, On The Thirty is not to be missed.